Okay, so you want to get into better shape and have started running with a few of your friends. Regular participation in a program consisting of cardio-pulmonary exercise can lower your risk of obesity, heart attack, and stroke. After you get comfortable running, your runner buddies might encourage you to reach an even bigger goal: running a marathon. This trend has become very popular and there are lots of people trying to do this—but before you jump right in enthusiastically, here are some tips which can help you. Although running moderate distances is a valuable part of an exercise program, running a marathon is completely different. In order to complete a distance of this magnitude, you will have to consider the following. The less experience you have, the more time you will need to prepare for the race. I often recommend six to eight months of training which includes several races of increasing duration. So begin with a five kilometer run and progress to a half-marathon distance. During this time, work on your training consistency and keep a training manual, complete with your distances, average heart rate, and how you felt. Make sure you vary your training terrain and make an emphasis to work on your stride, breathing and running economy. When you run a race, do not worry about the clock! 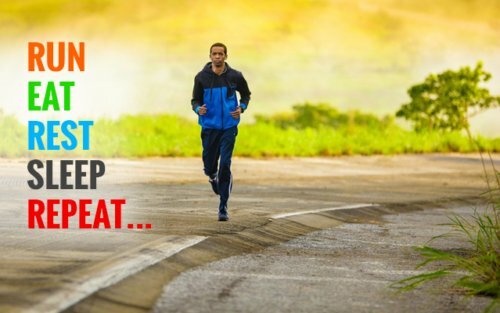 Just focus on the process, including your warm-up routine, mental preparation, and running technique. As time passes, you will begin to understand your body much better and can react to its needs. So now you have been running five kilometers daily for months and you want to train for a marathon race. My advice is to prepare your body to finish the race and not to necessarily compete in it. You can do this by increasing your distances gradually over the weeks leading up to the race day. There will be times when you will want to try longer distances of 15-20 kilometers but please be aware of the total training volume and intensity per week. This can be calculated by mileage or kilometers and by your average pace and heart rate. When you complete your long runs, I think it’s quite acceptable to also include short periods of walking for partial recuperation. These can get less frequent as you approach race day. Over-training is a very bad thing and can lead to injury and frustration. The mentality of “more is better” is not a wise notion if you are over 50 and inexperienced at distance running! It’s important to monitor your training and link this with how you feel, how you sleep and how you act. My recommendation is also to incorporate regular weight training to your training regimen as this will add stability, improve running economy, and help you avoid injury. In addition, regular flexibility work with massages can greatly improve your running performance, delay fatigue, and allow you to recover better following your workouts. The diet you consume can greatly affect the ability of your body to adapt to a training response and recuperate from your training. It can also affect your body composition and this factor is quite significant if you want to finish the race successfully. I do not advocate the notion of calorie counting as this can be a very frustrating exercise and not very practical. I do, however, advocate that you eat a cleaner diet devoid of all the foods which will impede your progress. Let’s focus on what you should eat and when. Protein: Eat excellent sources of protein including, fish, white chicken, turkey, eggs, low fat dairy, and extra lean red meat. The myth that runners need less protein is just that—a myth. You should be eating protein at every meal but the serving size can be moderate. Runners require fairly high amounts of protein due to a high rate of protein turnover. Fat: Eating good fats from nuts, seeds, olive oil, fish, flax, and avocado will not make you fat and, in fact, will help you burn stored body fat. Regular consumption of good fats will help you recover from a workout and decease the muscle soreness most runners feel. These fats will also stabilize your blood sugar and will allow you to train for longer distances successfully. Carbohydrates: This is one of the most misunderstood of the macronutrients in runners and athletes alike. If you eat the right carbohydrates at the right time, your body will become very efficient at storing glycogen. Glycogen is the storage form of carbohydrates which is stored in your muscles and liver. You must eat every three hours and each meal must contain carbohydrates, protein, and fat. The type of carbs you consume is crucial to the storage process. The intake of complex carbohydrates in contrast with simple carbs is the ideal choice. Simple carbs are found in white flour, rice, pasta, fruit drinks, granola bars, candy, and baked goods. Complex carbohydrates—founds in foods like oatmeal, brown rice, quinoa, sweet potato, and noodles made from whole grains—will keep your blood sugar stable throughout your training and will provide the fuel for your long runs. For every serving of protein you have, you should eat two servings of carbohydrates. Consuming generous amounts of raw or cooked vegetables with meals will provide you with the fiber, nutrients, and food volume you need to be satisfied. Adequate hydration, food selection, and meal-timing are the most important nutritional concepts to master as you prepare for your first marathon. As you progress towards the race day, you can determine your level of preparation by your training log, the way you feel, and how you look. If your training and diet have been successful, this will translate to improvements in running performance, lower rates of injury, a greater sense of well-being, and lower percentages of body fat. “Top 10 Marathon Training Mistakes;” http://fellrnr.com/wiki/Top_10_Marathon_Training_Mistakes, last accessed May 14, 2013.